1 Haken: Ah, Paris! I vas here last time durink World War I. 2 Ginny: "World War I"? Surely you mean The Great War. 3 Haken: Uhhh... Ja, ja. Ve haff no plans. Disregard die numbering. The background is a royalty-free stock photo from morgueFile. I have not been to Paris myself. Yet. 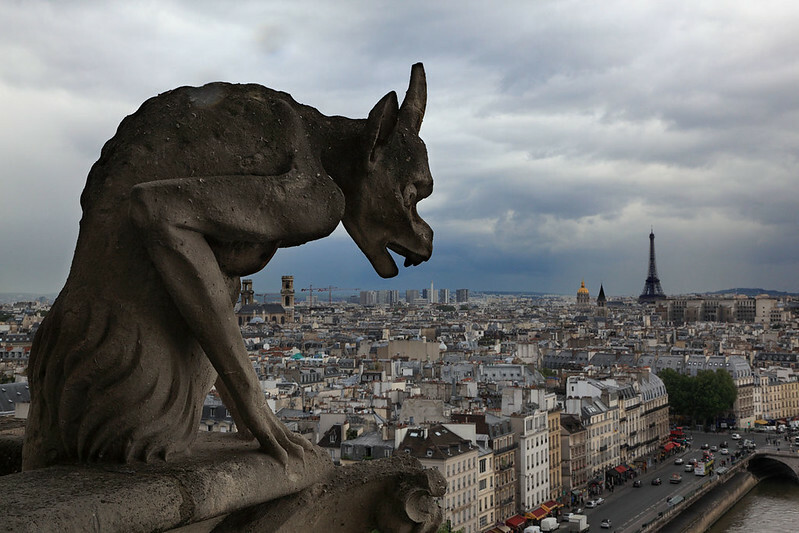 2018-10-07 Rerun commentary: I visited Paris for the first, and so far only, time in 2012. Note the similar position of the golden dome to the left of the Eiffel Tower. The dome marks the position of Les Invalides. Well, obviously the background is from somewhere near the top of Notre Dame, since they wouldn't want to crash their zeppelin into the cathedral. 'The war isn't over. The hate and evil is greater now than ever. Very soon war will break out again and overwhelm you... the Germans will soon rise again.' (quoted in S. Hynes, A War Imagined, 1992, pp. 566-67)."